The Welsh National Opera’s touring production of I Puritani is the first in their Madness-themed Autumn season, also featuring Handel’s Orlando and Sondheim’s Sweeney Todd. 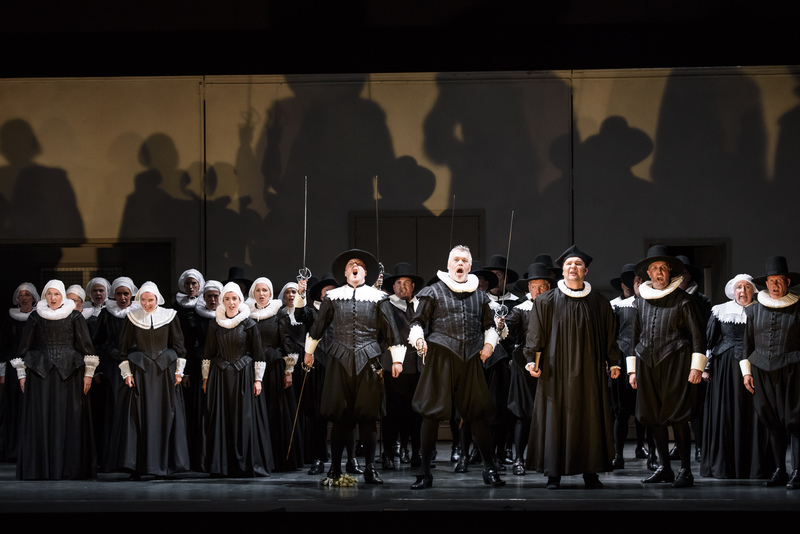 Their rendition has been called controversial for several reasons: for starters, setting the opera partly in Ireland in the 1970s and partly in the original 1640s was certainly a bold decision by director Annilese Miskimmon. Apart from the obvious Cromwellian connections and the fact that the Ireland of that era in part mirrors Britain during the Civil War, it wasn’t exactly clear why that period in particular was chosen. Indeed, equating Cromwell’s soldiers to 1970s Irish Protestants might even be considered highly provocative, and to what purpose? The themes of religious and political division, intrigue and forbidden love are easy enough to grasp without adding another lens through which to view them, especially considering the current geopolitical situation in the Middle East and elsewhere around the world. The production’s depiction of madness has drawn special attention, and rightly so. Some elements were very innovative, and are further proof (if any was ever needed!) that the operatic art form is very far from stagnant. Having a double (Elena Thomas) for the leading soprano, Elvira (Linda Richardson), multiplying to several doubles in the third act, added a visual element to the madness so fantastically evoked by the music and the libretto. On paper this was an inspired idea, especially combined with subtle, evocative touches such as Elvira ripping the flowers off her bouquet. However, the concept was slightly overplayed, with Elena Thomas valiantly trembling, wide-eyed, for what seemed like the entirety of the performance. It meant that the excellent multiple doubles scene in Act III and the occasionally hauntingly-lit appearances of Elena Thomas’s character lost some of their impact. Setting the production in what appeared to be a 1970’s community hall in Acts I and III, and a dark, cavernous room in Act II made the whole production seem a bit like a hallucination on Elvira’s part. This mostly worked very well, generally complementing the music and the performance, except when Elvira and Arturo first reunite. The simplicity of the set didn’t contrast, complement, or otherwise inform the overall audience impression of the scene in any profound way. But it was a brave decision, and shows how inventive and modern the art form can be, without undermining the original atmosphere of an opera that is almost two hundred years old. Bellini’s music and Pepoli’s libretto provided both orchestra, conducted by the eminent Carlo Rizzi, and Linda Richardson’s Elvira ample material for a nuanced, compassionate portrayal of madness. Linda Richardson’s physicality excellently expressed Elvira’s joy in love, and her ensuing madness after her fiancé disappears before her wedding, only very slightly let down by a somewhat blank facial expression at times. Elvira’s arias were magnificently sung, with ‘Qui la voce,’ and ‘Vien, diletto, è in ciel la luna,’ being particular highlights. Perhaps just as heart-rending as this complex portrayal of madness were Riccardo (David Kempster) and Giorgio Valton’s (Wojtek Gierlach) reactions, which were brilliantly sung and played, in one of the most memorable scenes of the entire opera. The aria ‘Suoni la tromba’, arguably one of Bellini’s most famous, lived up to expectations, closing Act II with a sense of impending doom triggered through brilliant playing and singing, and the depiction of Elvira’s worsening insanity. Special mention must be made of Alessandro Luciano, who stepped in to fill Barry Banks’s shoes as Arturo, and acquitted himself with panache, his Arturo being acted and sung with real feeling. Impressively, the fiendishly difficult high notes, including a high D-flat, in Arturo’s part did not pose any problem in the slightest for Mr Luciano. The moment when Arturo realises that Elvira has gone mad was rendered poignantly and was only one of many examples which illustrate the level of detail in which the cast approached the portrayal of their characters. This production has many strengths. Principal cast, chorus, orchestra and conductor are all on fighting form, and deliver an impressive, nigh on flawless performance. The setting resulted in mixed feelings, but if it furthers the debate about what opera is, and how to engage audiences, then that can only be a good thing. 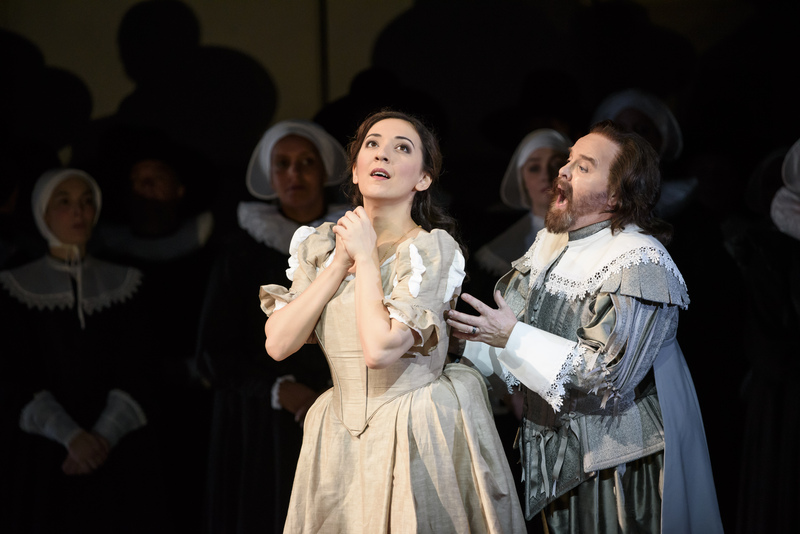 The Welsh National Opera’s production of ‘I Puritani’ continues to tour the UK; for more information and future dates, please visit their website.